Using exit 8 off of MD 32 to enter Ft Meade with your camper, enter the roundabout and bypass the Main Gate. Take the next right off the roundabout which looks (and is) the entrance ramp onto MD 32 west. There is an exit off that road that takes you to the Truck Gate/NSA Gate. You will be driving on the left side of a road that is divided and one-way. When you reach the check-point and finish, you make a U-turn to the right in the parking lot and go back through the gate up the opposite side of the one-way road you came in on. When you reach a stop sign, turn right – (left takes you to an NSA gate where you will have you turn around). Once on Ft Meade, turn left onto Mapes Road. Follow Mapes Road to the fifth stop light and turn right onto Ernie Pyle Road. Go to the stop sign and turn right onto Llewellyn Avenue. Go approximately 1/4 of a mile and turn left onto Wilson Street (the sign for Wilson is on the opposite side of Llewellyn). 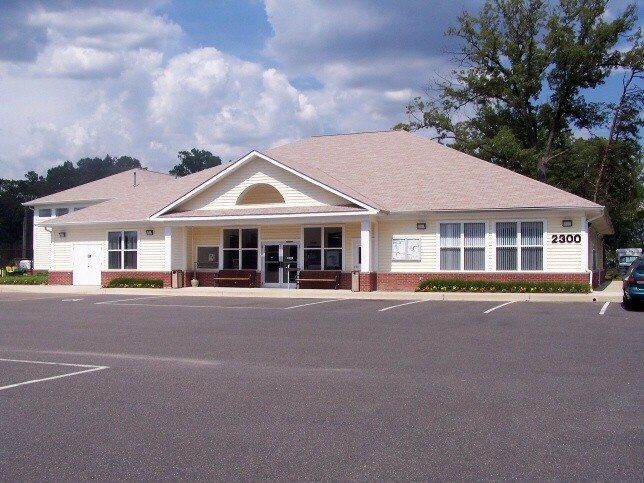 The park office will be on your left approximately a 1/4 of a mile down Wilson Street (Building 2300). Active, National Guard, Reservists, Retired, 100% DAV. 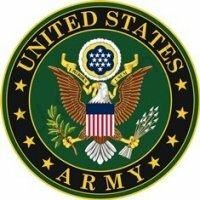 DoD and EPA Civilians. Reservations can be made for up to 30 days in peak season (Apr 1 - Nov 15) and 60 days in peak season. Soldiers can always make a 60 day reservation. Extensions may be granted ONLY on last day of your stay. You may need to leave the park until a site becomes available. 1 night's deposit required to hold reservation. Two dial-up phone access in lounge. Allowed, with usual leash and clean-up rules. Pets are not allowed in the cabins or lounge. Rates vary based on back-in (lower) or pull-thru (higher) site and season. On cabins, there is a $25 security deposit that is refunded back to you upon check out. If you wish to hook up an RV in the Cabin pad site next to the cabin and use both cabin and pad it is $45 a night with the security deposit. If you just wish to hook up to the Cabin Pad it is $20 and there is no electricity to the Cabin pad. Auto Hobby Shop, Ball Field, Banquet Hall, Bowling Center, Chapel, Game Room, Propane, Recreation Equipment, RV Storage, Trailer Rental, Volleyball. Freedom Inn Dining Facility is open to anyone on Mondays and Fridays. A popular destination in itself, yet close to visiting Washington, D.C. This is very convenient if visiting DC but there are lots of long term people here. Acorns dropping on the roof drove me nuts but the bugle or loud speaker woke us up every morning because it was super loud which it is a necessity on a military base. It is a very nice campground but I had to leave a day early and hate it that they do not refund unused days. We made a reservation back in February for Sep but they never contacted me to say that it had to be paid in full before May 1st or the new rates took effect. I would have paid in full but no one contacted me so that's life. Great showers and laundry. No playground for kids and tight one way roads to get in. At least they had propane refills and it was safe on base. We could have paid 80 bucks for Cherry hill but this campsite is definitely worth the cost. We had been here 4years ago. We actually came when they first opened. This time we stayed because of health reasons. I needed to go to Johns Hopkins for s condition they specialize in. We tried to get a site weeks in advance for my first appointment. They said they were full so we went to the Naval Academy that has primitive sites and would never be our first choice. We live in DE so it is much easier staying at a RV site because of our dog, and it is also a v ry long ride in one day. My next scheduled appointment ( for surgery) they did not have a space a month ahead of time. My 8 week check up we were able to get a site. Sadly when we got there we realize why it was hard to get a spot. They had so many homesteaders. They should hang a sign trailer park. They had this problem when we were there years ago, but was told they were changing the rules. I could not believe it when we saw a couple who were there when we were there 4 years ago, sadly we have seen this problem at many of the Fam camps which makes it hard to utilize this wonderful benifit. There was 2 homesteaders at Annapolis which meant they lived there without full facility’s. The one problem we had was a mean women who waited on my husband. Thankfully another women stepped in. I need to go back to the doctor in 8 weeks, hopefully we can make the 2.5 Miles one way, and get someone to check on our dog. A nice campground all in all, if you don’t mind a upscale price, kids everywhere’s, sheds, and messy site. One site had a boat. Very nice park with lots of elbow room. We were in #24 which is on a corner. The nearest RV to us was at least 50 to 75 feet away. The park is clean and they make everyone adhere to the rules (no parking on grass, no junk around, etc) which makes for a pleasing appearance. There was no wifi out where we were, electric was stable, water pressure was fine, and Verizon signal was 4G with 1 and 2 bars (not real strong). There are paved roads and concrete pads with gravel patios. Each patio has a fire pit and picnic table. The commissary and exchange were very nice. Here's our 2 complaints: First are the gates. The gates at the entrance and exit of the park are a pain. If you're on a military base where you are carded before entry, why do you need the gates? Second is Wifi/Hotspot. I called Verizon because my hotspot was worse than dial-up slow and normally it has very good speed. I was told that because of the area (between DC and Baltimore) the tower congestion is such that at certain times of the day it slows down to a crawl. That being the case, the park should have wifi repeaters. 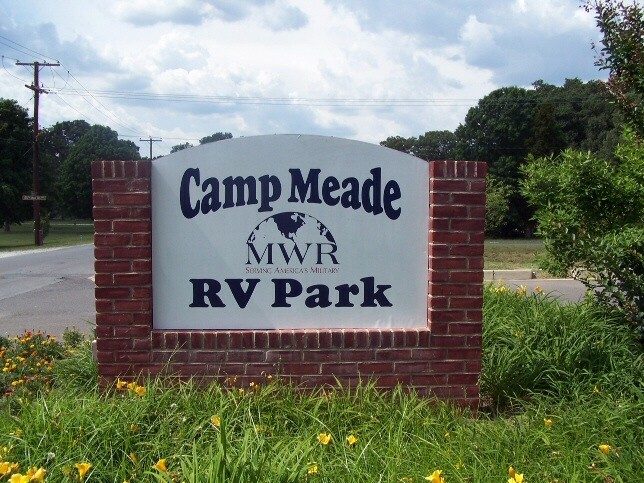 All in all we really enjoyed our stay at Camp Meade. We initially had difficulty making a reservation at this campground, having been told 60 days prior that "everything is booked solid until mid-September, but when I called in late June I was told there WAS a spot open for 7-11 July as they had just that morning had a cancellation. This is understandable, but what IS a bit confusing is the fact that during our stay I noticed an average of 5-6 empty spots each evening! Also, when we checked in we were given a letter dated 14 Feb 13 - signed by the Director, MWR - stating that "Active Duty Military may make reservations up to 12 months in advance. All other adult authorized patrons may make reservations up to 11 months in advance." No mention is made of "peak" or "non-peak" seasons: this is in conflict of above, which speaks of 30 days in advance in "peak" season & 60 days in "non-peak" season. Oh, well! Anyways, it's a very nice campground in a great location! Easy access to Annapolis (visit the USNA! ), D.C. & Baltimore. The Outdoor Rec staff is friendly & helpful! We had a VERY nice meal at the Hideaway restaurant in Odenton, MD about 15 mins outside the front gate. ENJOY! 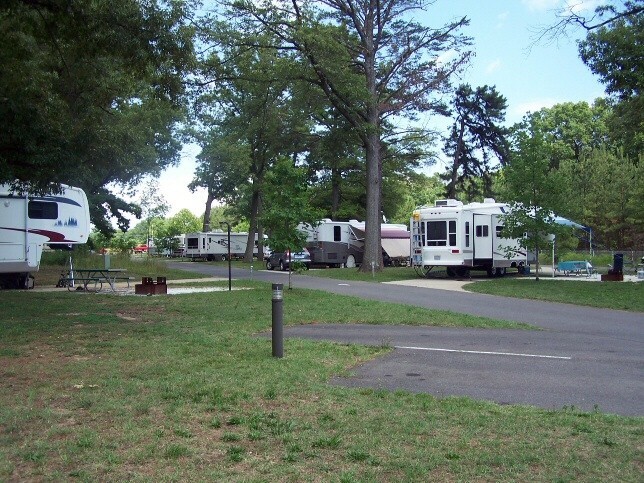 The location of Ft Meade and the quality of the RV Park make it an ideal, reasonably-priced place to set up a base camp for visiting POI’s in Washington DC, Baltimore, Annapolis, Gettysburg, and all the other historic and cultural sites in the surrounding area. This is our fourth two-week stay at Ft Meade. 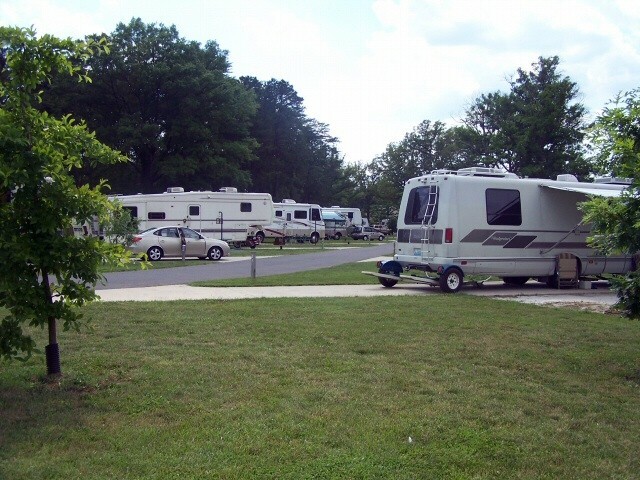 The RV Park offers more than just RV back-in or pull-thru sites. They have a large “Group Camping Area” for tent campers with an adjacent restroom/shower facility. The tent area has very limited shade so it would probably be advisable to have some type of canopy to lessen the effects of being in the hot, direct sun. The park also offers four small, air conditioned cabins which are part of back-in sites #’s 1, 8 (Handicap Accessible), 2B & 3B. It appears that the RV site-Cabin combinations are under-utilized. The concept provides a cost-effective lodging solution for groups when an RV alone cannot accommodate the lodging needs of the group. We will have two guests joining us during our second week and have already planned their stay in our RV. 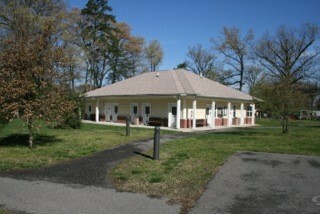 If we have guests during future stays at Ft Meade we will strongly consider the RV site/Cabin combination. Like most military campgrounds, Ft Meade also seems to have their share of active-duty homesteaders. However, the presence of homesteader does not seem to deprive recreational campers from being able to get a site. There appears to be RV’s coming and going every day, leaving several sites vacant each day. Having said that, we would not risk coming here without a reservation. We like to believe that we have a positive attitude about Ft Meade, but also recognize that it has opportunities for improvement. This review process is not the forum to complain or influence change. There are other ways to communicate those efforts directly to the organizations that have the means to implement changes or improvements. And finally, while in this area enjoy everything it has to offer – especially a trip to the Chesapeake Bay area for steamed blue crabs or crab cakes. Nice park. New concrete pads are nice but not level in the first area in the trees. Satellite reception not good there either. Pricey here for a military park....increases every time we come back. But we have friends in the area. Overall big sites and nice park. This was our first stay here. Had an good visit with family and friends. Had been stationed in the area during the late '60s. The prices were much higher and traffic much worse on base too. Roads on base were in poor repair and markings virtually non-existent. 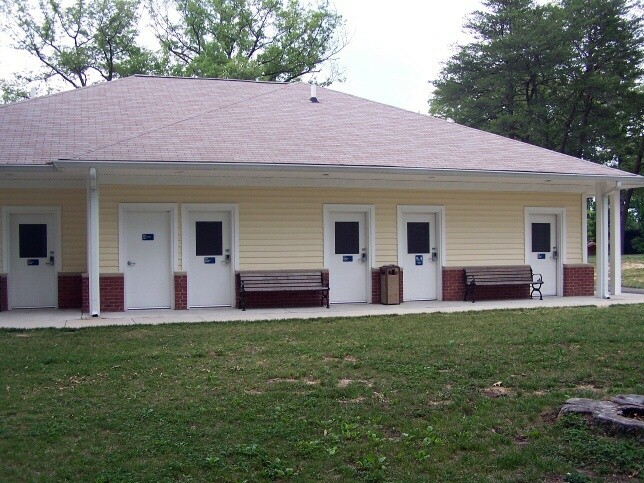 The famcamp and restrooms were clean and yard well maintained. Staff was friendly and helpful. The prices were high, but considering the area almost acceptable. The staff was accommodating in helping us to avoid the musical campsite moving, we only had to move once during a two week stay (thanks staff). Hope to return next spring when our grand daughter graduates from HS. Staying in the park until retirement. Best of the FAMCamps in the area. Staff is very friendly, sites are clean (concrete pads) and some site patios are concrete, otherwise they are gravel/grass. Lesson learned: As to the musical sites, when you make a reservation and only pay the deposit, you are not guaranteed that site! You must pay the full cost of your stay to guarantee and stay in the site you have selected. Wifi is new within the last year but an extender is needed to boost the signal. No signal what so ever for the back half of the campground. Bathrooms/laundry room/rec rooms cleaned every day and are nice. This was our fist time back at Camp Meade since 2011. W/S were adequate, electric marginal. Sadly, it continues to be a wonderful facility hampered by poor management at its office and, I suspect, poor support from post leadership. Several of the people at the Famcamp office (at the entrance to the camp) admit freely they've never been into the campground! There are a few great people in the office too. The percentage of long-term residents has grown since 2011, but may be legitimate under post policy. As others have mentioned, staff continues the often pointless forced campsite musical chairs game. While they did recently resolve the mold issue that had the rec room shut down (for over 4 years), the Famcamp suffers from a lack of facilities maintenance. It's sad because this has been and could again be one of the top Famcamps in the system. Check-in was smooth and friendly. Sites are clean and spacious. The campground is wooded, thus expect many sites to be satellite unfriendly. WiFi is not available in the campground, only in the office. Daily cost just rose to $42, which is a bit pricey for a military campground. Very convenient to Washington, DC and all the capital has to offer. We have family in the area and stay here often. In older reviews, the quality and courtesy of the staff came into question; the current staff are A+. Very helpful and accommodating. Trying to juggle sites to fit your needs. There are many active duty and contractors here; however, there always seems to be a few sites available (with the exception of Memorial Day Weekend & Navel Academy Grad Week). The stay limits seem to be enforced and you often see the Actives switching sites or leaving for a few days (5 day absence is required after you have stayed your limit). There is no cable and wifi is only good close to the office. Sat reception is iffy due to the tall trees. The Commissary is close by as are Baltimore and Washington and Annapolis. Propane is available during MWR work hours. I don't think there are any Camp Hosts. All issues are addressed by MWR during work hours. 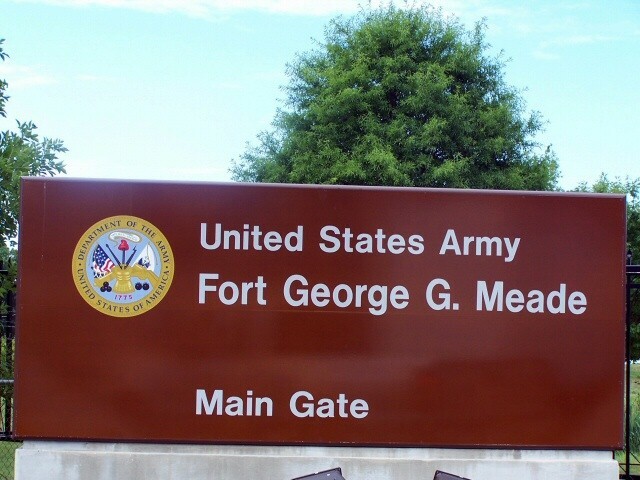 Effective July 1, 2016 the rates at Ft. Meade will increase to: Back-in: $36 DAILY, $210 WEEKLY, AND $870 MONTHLY. Pull-through: $42 DAILY, $$252 WEEKLY, AND $1050 MONTHLY. We have stayed at Fort Meade multiple times while visiting family in the area, and not too much has changed over the years. It is a great location for visiting the Washington, DC metropolitan area. The RV park has nice level concrete sites. The hookups are good with the exception of the high iron content in the base water supply. You definitely need to filter the water before using it. The RV park FINALLY installed WiFi, however it is really only accessible from within the community room. If you have an external WiFi antenna, you may be able to access it from your RV. Verizon service, while in the RV park, is not good (one or two bars). The base amenities are tremendous: a large commissary and exchange and a great gym. Full recycling is located just around the corner from the RV park on Rock Road. A sign was posted in the RV park, just as we were leaving, stating that the RV park rates were going to increase effective July 1, 2016. It did not state what the new prices would be, but at $38/night or $960/month (current rates for a pull-thru site), this park already was one of the more expensive military RV parks. If they are going to raise rates, they could at least expand the WiFi and include recycling services within the RV park. No cable or Wi-Fi and TV air signal is poor. The CG itself was extremely well maintained. Sites are level concrete pads. We had a pull-thru. The CG was almost full, mostly with permanents. For the off-season they have heated blankets over the water access. The price of $38 seemed high for the amenities provided, but what a great location to see Washington, Annapolis or Baltimore. We had to drive a few miles on base from gate to CG, but really easy on/off access to Rt 32. Watch going out the gate as it is toll booth width. I was watching the concrete bollards on my side & almost took out the passenger side mirror. We stayed in a motorhome. Oh, yes, almost forgot; our stay was a week night so can't comment about the weekend, but be prepared for 0630 reveille to be blared over an excellent PA system! Certainly got us out of bed. 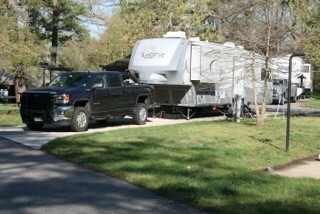 We stayed at the Ft Meade Campground as a stopping place on our trip down to and back from Myrtle Beach. When we got to our site on our way down we all looked at each other and said "Can we stay here for the week?" 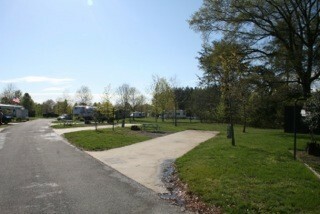 Very clean campground with well layed out sites. We had a back in site on our way down and a pull through on the way back. I had no trouble getting a 42' 5th wheel into and out of either. The MWR Office was very helpful with both of our nights being on the weekend when they are closes. I got phone messages on my cell phone giving us the codes to get into the campground and for the shower facility. We are already planning on coming down and staying to do the "Washington" thing some time next year and will definitely stay here when we do. 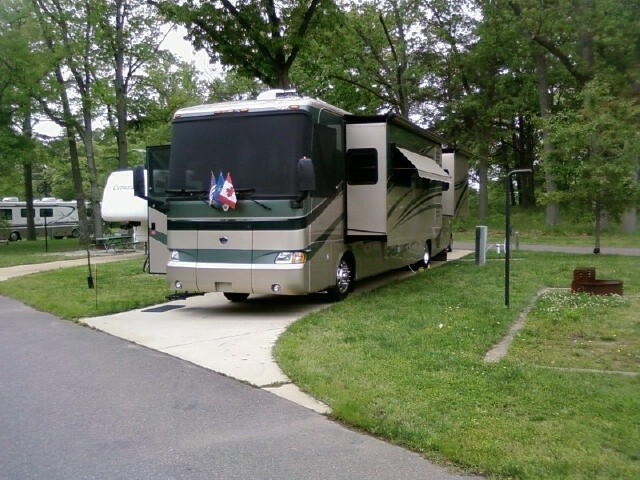 Sea Mist in Virginia Beach on the 13th, now Camp Meade on the 25th, I’m really pushing this new RV thing. We came here to visit my son and grand kids, my son is stationed here. This is a very nice park. Quite a few log term campers, but still plenty of empty sites the week we were here. I read one of the previous posts about the shower rooms and he/she was spot on, they are individual rooms clean and private. Access to Post was easy, my son checked with the guard at the Reese gate about RVs. Guard said no problem. I showed up Saturday afternoon and had no problems with my GMC 2500 and 33 ft 5er that requires 12’5” clearance. If you enter via this gate make the first left on Ernie Pyle st. cross Mapes Rd (flashing red light) Turn right on Llewellyn Ave (Stop Sign), and left on Wilson St. (at hospital). Camp Mead is on your left, lots of parking for RVs. Yes the office has limited duty hrs, closed on weekends. However I made reservation for a Sat arrival and on the Friday before they called me and provided a site number and codes for the entry gate, and bathhouse, on Monday morning at 0900 they called and politely asked me to stop by to register. Very pleasant happy people. I will be here again. Super quiet, comfortable park. We 'wintered' here and it was perfect! They allow you to skirt your RV unlike Andrews which helped allot. Nice office with multiple employees with regular hours. Can refill propane onsite. 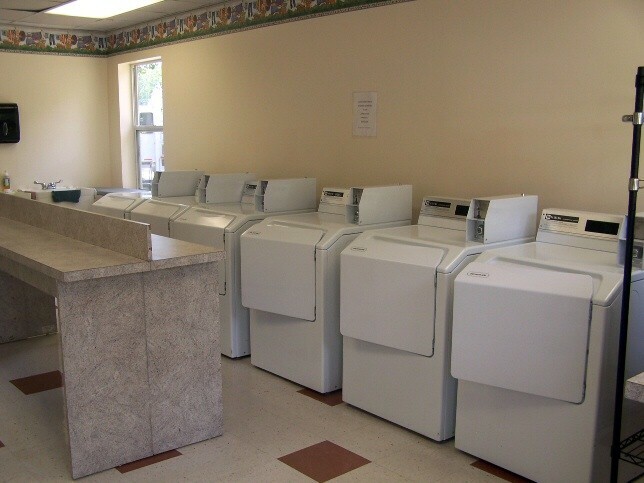 Two large shower/ laundry facilities. 5 miles from Metro. A very pleasant first-time experience in this campground. I absolutely will return. Having read previous posts I was pleasantly surprised to NOT find grumpy, unhelpful management. The staff that runs the facility could not be friendlier or more accommodating. My only dings on amenities/facilities, and thus the reason for four stars instead of five, are (1) No WiFi in the campground and (2) Office hours. It is hard to reconcile an "Outdoor Recreation Facility" that limits its hours to 0800-1600 Mon-Fri. My military experience was that most "outdoor recreation" was done after hours and weekends. One afternoon I returned to my campsite at 1630 to find somebody had made off with my power cord (connection to shore power). I had to wait until the next day to speak with someone in Outdoor Rec and get it back (a Good Sam though someone left the power cord behind and turned it into the office). Admittedly, a relatively minor point. The shower, restroom, and laundry facilities were spotless; although perhaps we can turn the temperature up a few degrees in those shower rooms (yes; shower ROOMS -- each shower is a self-contained key-pad accessible room with shower, toilet, sink, mirror, electric outlets . . . VERY convenient). The cumbersome Post access through the truck/delivery gate is due to the oversized nature of many RVs (can't fit through the normal Post gates). If traveling in a Class B (as I was), access through the normal gates is easy and painless. Just be sure to have your ID handy to present to security. We have stayed at this park before and would do so again. Yes, the price is high for a Famcamp but when you consider the area it is just fine. We have stayed at a few Famcamps that are in the $30 range. We paid $33 a night here. Our only complaint about the campground - the building next door has a brand new loudspeaker that they are very proud of and it is LOUD! Reveille is played at 6:30 AM, colors at 5:00 PM and Taps at 9:00 PM. 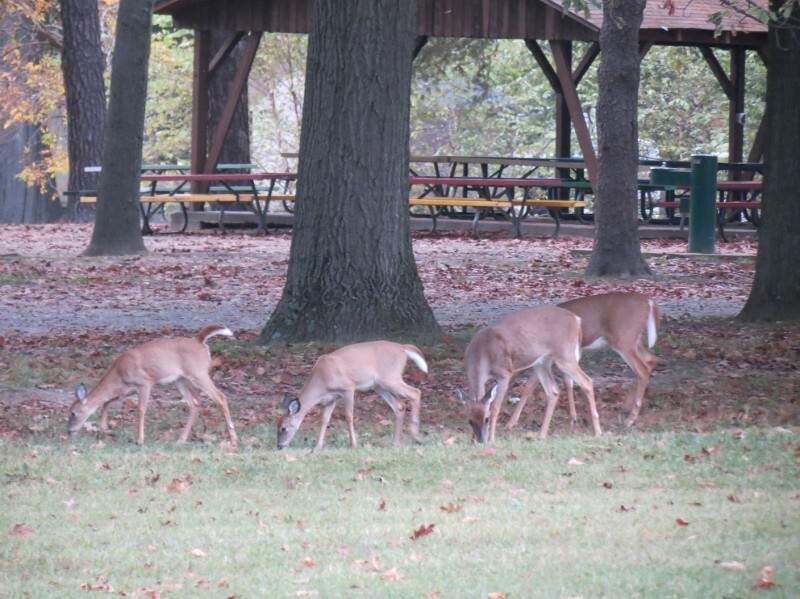 You will not miss them as the sound echoes through the park. Not the parks fault but don't jump a foot when it starts! I am used to hearing these, just not so LOUD. I submitted a change to the directions. Once you get through the commercial gate and turn left on Mapes road, follow it until it ends at Ernie Pyle Road and turn right. Turn right at Llewellyn (stop sign), and then left on Wilson. Outdoor Rec will be up on your left. Park in the lot and check in. We have stayed here multiple times over the past couple of years, and there is one thing of which you can be sure--nothing ever changes. Yes, it is an ideal location. Yes, they have nice, wide concrete sites. 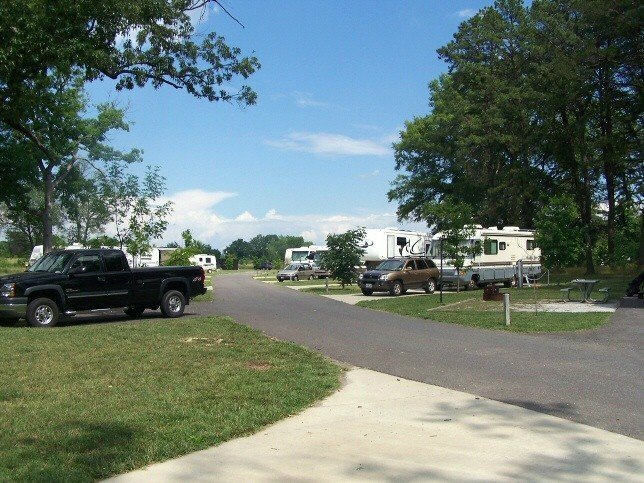 Yes, there is not another RV park in the area that comes close to the price of this park. With that being said, there has been no effort to improve the RV experience at this park in years. We paid $231 per week for our four week stay. 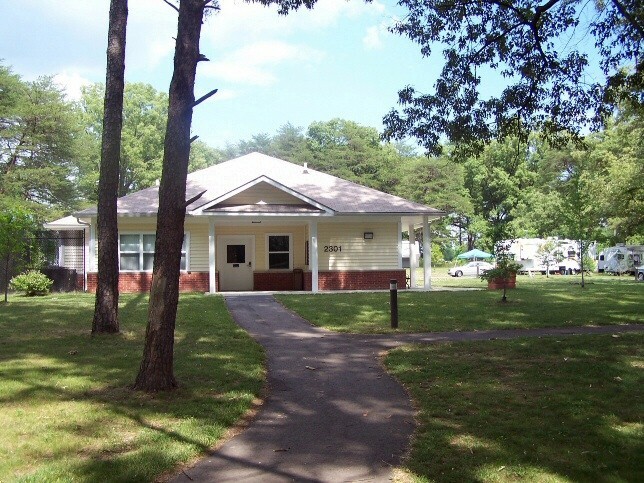 We have stayed in many military RV parks across the eastern and southern United States, and nobody charges more for less than this park. The water quality is absolutely horrible. There is a lot of iron in the water, and dark orange surges are common. Plan on going through at least one water filter per week. There are many overhanging trees throughout the park that need trimming. It is virtually impossible to drive through the park without brushing against tree branches. There is still no WiFi and there is no plan to add it to the park's amenities. The office staff is friendly enough, but after you check in, you will not hear from them again unless they have a problem with something you are doing. Here is the crazy thing--we will definitely stay here again because it is still the best deal in the area--and they know it.